That’s what I remem ber in the beginning…wishing that there had been just 2 minutes difference that would have changed that near fatal experience where I almost lost my entire family in one horrible car accident. I can still remember arriving home to a dark house after a long day of work and riding my horse. I had an ominous feeling as I entered our home which should have been a flurry of activity with two young children ages 2 and 7 and their father cooking dinner. I still can hear the kids crying in the background on the answering machine as a man at the accident scene was trying to contact me two hours prior. The panic I felt not knowing the condition of my husband and having enough information to know they had been in a very bad accident with a semitrailer. The mental control that was necessary to drive to the hospital safely. Arriving to find my kids with a social worker who desperately needed their Mommy. I think most people who have experienced the effects of traumatic brain injury to a family member or loved one will always hold those memories of before, during and the new normal after. It is a life changing moment that begins with fear and prayers for survival, wishing it had never happened and then acceptance and hope for the future. Brain injury is very unique to each survivor as the trauma that occurs is caused by a specific accident and no two events are exactly alike. In Fritz’s case, he and the kids were sitting on a bridge stopped in traffic when a semi traveling too fast in the opposite direction neglected to brake soon enough and jackknifed directly into our Camry at the driver’s side. The truck hit Fritz with such force that he experienced brain sheer and a subdural hematoma. After emergency brain surgery which included removal of dead brain tissue due to the hematoma, it took two weeks before Fritz was stable enough to be sent to Marianjoy for rehabilitation. He had to relearn to sit up, eat, talk, walk and regain the most basic physical and mental capabilities that were second nature in his prior life. Acute rehabilitation lasted four weeks and he was able to come home while continuing outpatient rehab for another six months. Due to the care and support required to manage Fritz’s recovery, attending to the emotional scars that my young children experienced and managing our home and finances without a partner, I lost my job. Brain injury has many victims. At 39 years of age, Fritz had been a very successful sales professional who sold very technical Cisco networking solutions to CFO’s and CIO’s of various companies. Since that time, he was never able to maintain a job of any kind due to the deficits from his injury. He has to be on several medications to manage his behavior and treat epilepsy caused by scar tissue in his brain. He has been back to Marianjoy for rehabilitation twice due to falls that resulted in additional brain damage. The family held together through all of this change and created a new life by pursuing a dream that Jane and Fritz had always wanted. They purchased property in Hampshire, IL in 2001 and built their equestrian business called Serosun Farms. Working outside doing farm work and taking care of horses was very therapeutic for all. Giving Fritz a safe place where he could still work in a supportive environment. A happy place for the kids to grow up and thrive. It has been a long 20 years, but we keep moving forward. Fritz has still maintained a positive attitude despite the limitations he endures. His outgoing personality that made him the life of the party and always the top salesman wherever he worked still remains. His love and knowledge of the NFL has kept him competitive in his Fantasy League as his friends can attest! His children have grown to be compassionate adults who understand the challenges life can bring as they’ve seen their father live with disability. The reality and challenge for most TBI survivors is financial difficulty. The costs associated with ongoing care, physical rehabilitation, medications, psychiatrists, neurologists, hospitalization, etc. is great and can be overwhelming. Everyone deserves a quality life and we support fund raising for organizations devoted to helping TBI survivors and their families. The more help and rehabilitative support as well as social programs for this population can restore hope, capabilities and happiness. We want to help others to thrive as this has been our life’s work for Fritz. New Equestrian Services coming soon!! 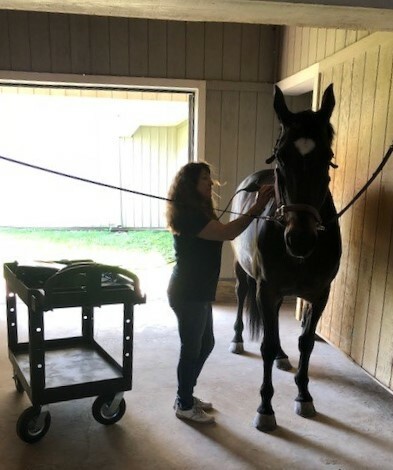 Serosun Farms Equine Services is excited to announce the launch of a new wellness program at Serosun Farms Equestrian Center. Ultimate horse care and welfare has always been the goal for Jane Stickland throughout her forty four year equestrian career. 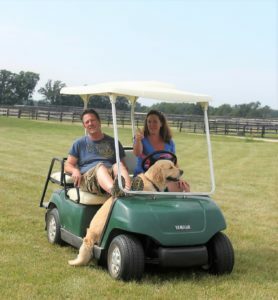 From managing a barn and show team in high school, to running a horse sales and training business in various locales and in 2001 building the Serosun Farms world class equestrian facility, she has always pursued excellence in horse care and management as the basis for competitive success. So to get to the crux of what would be ideal is they don’t get injured in the first place. This really applies to all horses, competitive or not because people make the investment to own a horse to enjoy the riding experience and if all your doing is spending money on vet bills, it’s not much fun. Jane wanted to have success and longevity with her horses in competition but always believed she would inevitably reach those goals if her horses were foremost happy and healthy in their job. So to get to where Serosun Farms Equine Services is today is the constant search for better ways to manage supportive equine therapies that are non-invasive, drug free, stress free, targeted and most effective. Accelerate the rehabilitation and healing of many common lameness disorders. Maintain the peak performance with any equine athletic discipline. Prevent the occurrence or recurrence of athletic injuries. One of the most important aspects of equine sports medicine includes the maintenance of these athletes at their highest level of performance. Deep-tissue laser therapy is an invaluable tool for this endeavor. All athletes have to endure the rigors of training. This training results in pain and soreness. Periodic therapeutic laser applications allow these equine athletes to recover faster and therefore train more efficiently. The ability to use laser therapy to prevent injuries is often overlooked or even considered non-efficacious. How important would it be to establish blood flow and elasticity within the tissues of the suspensory tendon, in an equine athlete that is predisposed to stress in this anatomical area, before a competitive event? 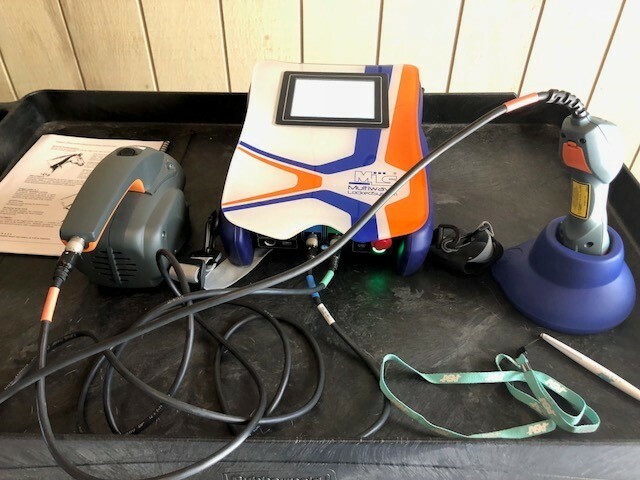 Deep penetrating laser therapy accomplishes this goal as well as providing muscle tissue therapy to support the joints and keep the horses moving at their optimal level. An analogy to this application is currently being used by athletic trainers. A high percentage of Major League Baseball pitchers are having a therapy session applied to both shoulders and elbows before their scheduled start. This preventive application technique has allowed them to warm up more efficiently and perform at a higher level. After the game, these same pitchers receive additional treatment to allow them to recover faster and stay in the starting rotation. In summary, Laser therapy is a very effective and safe therapy and is cumulative in effect. Each treatment is complementary to the last on a cellular level. 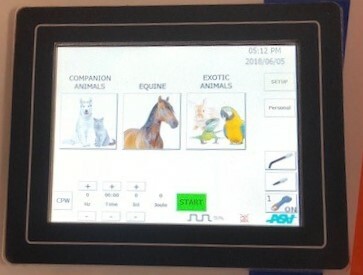 Each case is unique and a therapeutic goal/plan will be established setting realistic expectations for the owner or trainer. Proper shoeing, dental care and saddle fitting are imperative to achieving optimal results. A few of our wellness partners include a top class chiropractic practitioner and long line rehab and training services.We are currently using the laser now with amazing results. Jane has received her MLS laser therapy training and certification and is actively treating horses at this time. There is a grand opening educational event and celebration with wine and appetizers taking place on Thursday, June 28 starting at 5:00 p.m. There will be guest speakers, demonstrations and representatives of the Cutting Edge Laser Therapy product attending as well as Serosun wellness partners. To find out additional information about these exciting services or to attend the event, contact Jane Stickland at 847-922-9809. 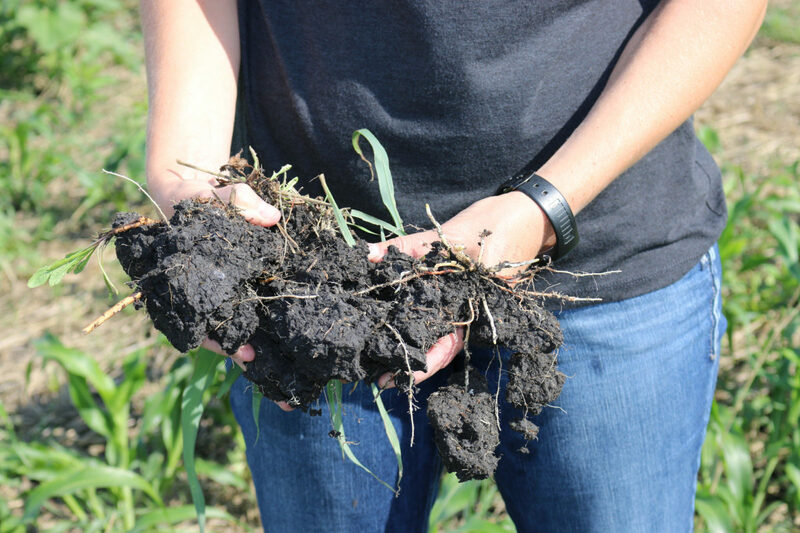 Here is an interesting article on one of the new faces of agriculture – regenerative agriculture. There are a lot of interesting things happening and organic may not be the “be all end all” in terms of turning our food system and farm system around. We organize our approach around four core, interconnected areas that should be considered in designing, building, and operating sustainable homes: Resource Conservation, Energy Conservation, Water Conservation, and Environmental Quality. Many of the products, technologies and building techniques that we have selected address multiple areas within this list. Efficient Design – Design efficiency means creating homes that are right sized for the resident’s needs and that are efficiently designed to minimize the amount of materials, such as wood and concrete, needed to build the home. Use of Resilient or Durable Materials, Durable Design, Durable Construction Techniques – A durable home lasts longer, requires less maintenance, uses less materials over the life of the home, and generates less solid waste by reducing the need for replacing and repairing worn or failing components. Use of Materials and Material Manufacturers who employ the 3 R’s: Reduce, Reuse, Recycle – Green building can reduce the resource load of the house on the environment by selecting materials and products for the home that come from manufacturers who utilize the 3 R’s. They have reduced their consumption of resources by reducing the amount of materials incorporated in their products, reusing materials, and/or incorporating recycled materials and other waste streams as inputs into the production of their products. Use of products from renewable resources – The selection of materials and products that utilize renewable and rapidly renewable resources, such as wood from sustainably managed forests or rapidly renewable resources such as bamboo. These materials generally do not contribute to the depletion of our natural resource pool. Use of locally or regionally sourced resources and materials – The use of materials and products that are produced within 500 miles of the site reduces the energy requirements for transportation and helps support local businesses and the local economy. Waste reduction and recycling – Reuse and recycling of waste materials generated from the construction of the home and from the operation of the home lowers the solid waste burden on landfills and provide a source of materials for use in new green products. Passive Design Techniques – Passive solar design elements take advantage of sun and shade to heat and/or cool the home and include building orientation, window and eave design and placement, landscape design, and the use of thermal masses to store and radiate heat. Thermal Efficiency – Thermal efficiency starts with the shell of the home and includes the selection of improved traditional or advanced framing systems, insulated foundations, advanced insulation systems, along with thermally efficient windows, doors, skylights, and roofing systems. It also includes good, quality building techniques and materials such as adequate caulking, moisture control systems, etc. These elements are cost effective and can reduce heating and air conditioning loads by 40-60% over traditionally-built homes. Energy Efficient Elements – Use of high efficiency lighting, appliances, and other electrical systems to reduce electrical loads of the home, energy efficient water heating systems and The use of management systems such as home automation and automated lighting systems can optimize the use of energy by lighting systems, home heating and cooling systems, and other appliances and energy-consuming elements in the home. Alternative Energy Sources – The integration and use of clean, renewable energy sources available on the site including geothermal heating and air conditioning (ground source heat pumps), solar thermal (hot water) and photovoltaic (solar electric) systems, and small scale wind generators. Water Conservation – Water conservation includes reducing the amount of water consumed by the home and its inhabitants. It also includes reducing the homes impact on the local watershed and aquifer. Efficient Water Use – Low flow fixtures, water efficient appliances, efficient irrigation systems, and gray water systems all aim to reduce the overall consumption of water. Water capture/reuse – Rain harvesting systems that capture rainfall for reuse in irrigation reduce storm water runoff and increase water infiltration. Gray water systems similarly capture useable wastewater for irrigation. Water Quality management – High-efficiency water purification systems for potable water and use of a variety of techniques, from high-efficiency septic systems to landscaping elements, can be used to clean water infiltrating into the aquifer and water discharging to the watershed. Storm water management – Managing the storm water runoff from the home means improving both its quality and the timing of its release into the watershed to more closely match the characteristics of the natural runoff cycle. 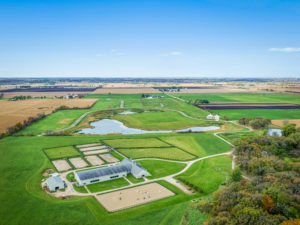 Landscaping elements such as rain gardens, permeable surfaces, rainwater infiltration systems, and other approaches turn water that would normally become surface runoff into a resource that waters trees, recharges groundwater, and provides a longer-term water source for streams. These approaches function to improve water quality by removing some pollutants from the runoff as it infiltrates the ground. Indoor environmental quality – Improvements in the environmental quality of life for people living in green homes may arise from improved indoor air quality, improved ventilation, etc. Approaches include the use of low VOC materials in home construction and finishing, solar/natural lighting systems, automated ventilation control systems, etc. Pollution Prevention/Reduction – The goal here is to limit the pollution that the home and its inhabitants create either directly from the operation of the home (e.g., energy use) or indirectly from the production of the products used in home construction. Habitat Protection/Development – Backyard habitat programs, the use of native plantings in landscaping, and other mitigating efforts can not only limit the impact a home has on the natural environment but can even improve local conditions. Soil and Water Conservation – The impact of the construction and operation of the home on soils and watersheds can be reduced or eliminated by limiting erosion, improving rainwater infiltration, and cleaning all runoff from the home site before it is discharged into the watershed.